Are you happy with the decisions you made regarding post secondary education? According to Gallup’s On Second Thought: U.S. Adults Reflect on Their Education Decisions, most Americans (51 percent) would change at least one of the following: choose a different major (36 percent), choose a different degree (12 percent), or choose a different institution (28 percent). This simply puts a number to something we already know, either through our own or others’ experiences. We all know the person who is disengaged at work, talking about wishing he or she could be doing something else. The business executive who would rather be a teacher, for example. Gallup conducted a follow-up report Major Influence: Where Students Get Valued Advice on What to Study in College to illuminate who is giving the advice. The report identified four sources of advice: formal sources (counselors and media directed at giving advice), informal social network (family, friends, and community leaders), informal school-based (teachers, coaches, and staff), and informal work–based (employers, coworkers, etc.). Most people (55 percent) receive advice from the informal social network. This make sense: get advice from the people who know us best and care about our well-being. Formal sources are the second highest referenced source (44 percent). Younger attendees increasingly refer to internet media about their “chosen field of study”. For me, it was a family member who helped me get on track right before my senior year of college. I was told to start taking learning seriously (attend every class, do the homework, and study hard for tests) and encouraged that I could do much better. The advice did not impact my decisions, but put me in a place to make the most of them. The switch was turned on; I got Dean’s List both semesters and performed well in graduate school. Now I question whether I should have a degree in education instead, nevertheless, I am constantly using my skills from my degree in business management and computer applications. Informal work-based sources are the most helpful (83 percent), which include advice from experts in the field and workplace experiences (9 percent). And as the study concludes, there is huge opportunity for growth with experiential and applied learning. Imagine having K-12 students constantly sampling learning projects and experiences for a potential ‘field of study’ and ‘possible degree’. They keep track of each task and their impression; so not only track what skills they are learning, but also explore whether an experience might be a future fit. Skills Based Approach is the platform for experiential learning, a way to work with students’ evolving skill sets. Collecting Skills Labels creates a record of what learning tasks students have completed throughout their lifetime. Author TheProfessionalWebsitePosted on January 18, 2018 January 18, 2018 Categories Skills Based Approach, Skills LabelTags education, higher education, skills, skills based approachLeave a comment on Are you happy with the decisions you made regarding post secondary education? I have always had a broad perspective of skills, often depicting them as the foundation of learning and verb of knowledge (phases I have used over the years). I understand my perspective is not shared by everyone (yet), though it is gaining momentum. Thought it might be useful to make a case for my all-in investment with skills, competencies, and related methods and applications. A few years back, I searched and got my hands on an unscrubbed database of skills. It had about 4,500 skills. Since then, I have been slowly rebuilding the database to add definitions, categories, and incorporating them into a search. The benefit is I have a single database feeding each of the Skills applications: Skills Based Approach℠, Skills Label™, and Skill Syllabi℠; practitioners and learners work with the same set of skills. It is a never-ending process as skills are being added all the time. Often when a new technology is introduced, there are also new associated skill(s). A great example is mobile internet and cloud computing and all the skills associated with using this technology. According to Future of Jobs survey “mobile internet, cloud technology” (22%) is the top technologic drivers already impacting employees’ skills. Big data, processing power, new energy supplies and technologies, internet of things and sharing economy are other drivers mentioned in the survey. A great resource to understand the demand for new skills is the Future Work Skills 2020, which identified some of the emerging transferable skills (such as transdisciplinary, cognitive load management, cross cultural competency, virtual collaboration, design mindset, social intelligence, sense making, and computational thinking). The chart above shows a sample from the database. There are five skill types, with a total and percent representation in this sample. The chart is meant to show proportion of skills assigned to each type and introduce five skill types. Technical skills are what most people think of when talking about skills. They are unique to a subject or discipline, which we apply in a career and sometimes work towards mastery in. Of course, this type of skill holds the largest share, has the most new skills added, and has the biggest swings in demand for related skills. Transferable skills transcend across disciplines and subjects. Theses skills are becoming increasingly important as workers are changing careers more frequently. Building competencies with these skills makes it easier to fill skill gaps when pivoting into another career. Thinking skills are the foundation of learning gained from education and higher education. With proper thinking skills, many of the technical and transferable skill can be learned. Thinking skills also make life more meaningful and allow for persons to interpret arts and the humanities. (In his book) Derrick Bok says: “professors almost unanimously agree teaching students to think critically is the benchmark of higher education”. Finally, these 8 skills do not change much so it is critical is to understand the methods and application behind them. Art skills are those related to arts and the humanities. There is a lot of skill required to become an expert in these fields. Some is acquired through application and some through natural talent or inspiration. Skills are also needed in the interpretation of arts and humanities. Understand the slight change from STEM to STEAM, a worthy addendum. Skills are tangible, something to talk about. They are: Definable, standardized, portable, searchable, measurable, and flexible. Skills are the ‘verb’ in knowledge. It is the action part. Skills define how we think, converse, problem solve, create, engineer, write, debate, play and so on. They are the underlying foundation of all learning. I have been working on skills and skill competencies for the past six years (published A Skills Based Approach to Developing a Career in 2013). My work with Skills Based Approach has gained a significant audience and following around the world. Recently, I have focused on a new innovative concept: Skills Label™ – one standardized display for learning in any task – online game, virtual reality, courses, videos, activities, etc. When I talk to professors about assessing skills in Competency Based Learning (CBL) programs, they tell me “there are institutions working on developing competencies but there are no clear standards already in place”. (I guess I am looking for something like Common Core in standard education.) Some professors seem perplexed and ask: “Where would you even start to create a standard for addressing skills?”. Some professors are not convinced in the necessity of teaching and tracking learning at such a discrete level. The challenge is trying to develop a one-size fits all approach to assess skills. I argue, in our every experience, we apply skill. Skills work laterally across subject and disciplines. There are thousands of defined skills (I reviewed a LinkedIn database of 4,500 skills). The list only keeps growing with new technologies being defined every day. Addressing the breadth of skill assessments is a challenge. Skills work vertically across education, higher education and career stages. For many of the foundational thinking and soft skills, we use them throughout much of our life. Critical thinking is considered a pinnacle skill, one we start learning in high school and is the benchmark of higher education. To learn a skill for our “own needs”, it takes twenty hours. To become a master, it takes ten thousand hours (according to one commonly referenced yardstick). Creating a measurement that works across what could be an eight to ten-year stretch is difficult. Addressing the depth of skill assessments is a challenge. · Standards. A way to anchor Level of Difficulty to actual standards, either universally accepted ones (like Common Core) or dynamic ones (created by a group of practitioners). For example, Common Core standards are linked to a grade level. · Underlying Methods and Application. Measure the intensity and frequency the underlying methods of a skill are applied. This is thinking one level deeper than skills. · Skill Points. An algorithm calculates this measurement of learning based on the other elements and time spent. Perhaps the most difficult element to quantify is: Level of Difficulty. Applying standards helps to anchor a level of difficulty to an education or career stage. But, I think the most compelling process to assess skills is to work with their methods and applications. Count the number of times the method is applied, measure the difficulty in applying it. For example, there are perhaps 20 to 50 methods behind applying the skill of Critical Thinking. It is easier to evaluate Critical Thinking by working with these methods as a framework. Ideally, (I believe) accurate, new age assessments based purely on the application of skill (as opposed to being rooted in grades, age, demographics) become a gold standard in learning. When you develop a new, innovative service/product, you must convince an audience why they should use it on top of the other products they are already using (especially with technology applications). (I typically hear: “Why? 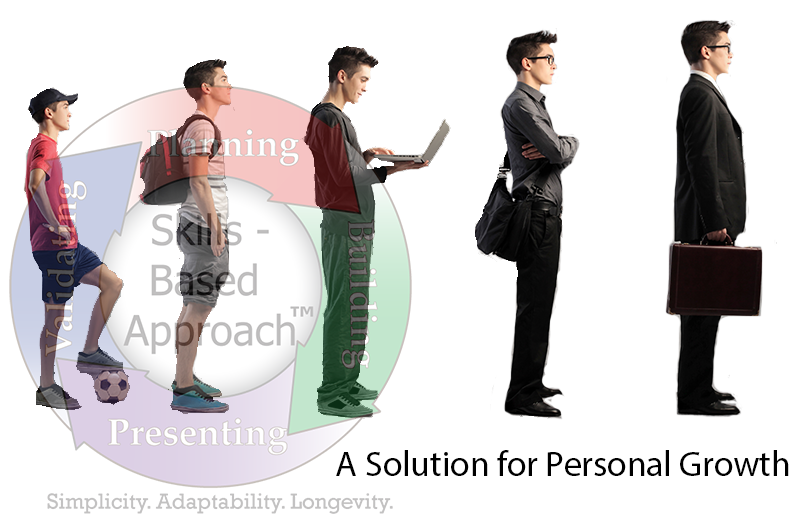 I am already doing this…”) Skills Label™ is a fundamentally different concept than anything else. The objective is to create one standardized display for all learning tasks (analogous to how a food label represents nutritional value). The time it takes to create a label is not an issue. Using the label wizard, it is possible to create a label in less than three minutes. Using the upload, it is possible to upload hundreds of labels in less than a minute. Game creators create Skills Label™ for their games (an argument could be made that learning takes place in any game). It becomes a clear signal (especially to the naysayers of games in education) precisely your learning expectations and desired outcomes. Instructional designers use a label to clearly define learning expectations and outcomes of a resource they are creating. It might be first step, before they start designing their resource. 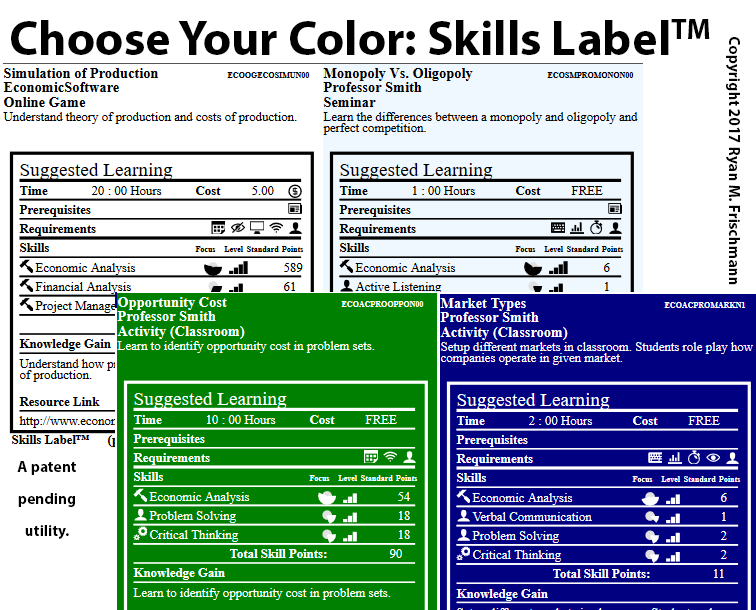 Teacher or professors use Skills Label in your classroom for project, activities, and experiences. You create a label for an activity you created on your own. You reference or create a label for resource you want to use in your classroom. (A benefit is you can create a collection of Skills Labels and give your students some choice in which ones they want to participate in). Education Institutions create labels for their entire curriculum with one simple upload. Put a label on a website marketing the resource (game, course, video, etc.). Send students to the public URL for the label (provided by Skills Label). Email the label and a link to it online. Print the label on any brochures or packaging of your product. Skill Label shown as a graphic in various file formats. Access to database of skills, competencies, standards, and requirements. Public URL and landing page. Option to have label indexed in public search engine. Of course, the biggest benefactor of Skills Labels are the high school and college students. For students, they access, collect, and use the Skills Label platform as a free service; all learner accounts are free. Skills Label is an ideal way to represent learning of discrete tasks and as students consume the resources represented by the labels, they store and catalogue them as a record of their learning. (There is already cross functionality with Skills Based Approach where a student can one-click add a label to their list of current tasks.) Students store Skills Labels in a collection for later consumption. As the movement gains traction, students will have access to a search engine to find learning resources based on content collected from the Skills Label. This creates awareness the resources exist. Perhaps the biggest value in Skills Label is a platform to make comparisons among potential learning resources. A student has all the information needed to decide on spending time and/or money on a resource, including: ROI, personal learning preferences, accessibility, cost, credential earned, and the experience itself. Competency Based Learning (“CBL”) has been talked about in education and higher education as an efficient, effective way of learning for many years now. CBL is efficient by letting student move on when they can prove a desired competency; learning evaluations are less dependent on how much time is spent in a classroom and the established credit hour system. CBL is effective by helping every type of student: 1) underperforming students get added resources or support to help them reach a competency; 2) average students control how much time they spend learning and may compete with students with more ability if they choose to; 3) high performing students get to keep moving forward when they prove a competency. Our traditional education system has moved towards CBL with the adoption of Common Core standards. The standards are largely based on advancing basic skills in English, Math, Social Studies, and Science. The learning expectations are explicit and accessible. When the resources tied to the standards catch up (particularly assessments), students learn at their own pace. In the future, we see less learning expectations based on grade, age, and demographics. In higher education, between 2015 and 2016, the number of CBL programs grew from 50 to 500 CBL programs (according to Tech Crunch) and this number will continue to grow. Higher education institutions have been trying to reduce expenses for decades with little success; students owe over 1 trillion dollars in debt. CBL is one answer. Rather than focusing solely on cost cutting and expense side of the equation, institutions adopt CBL with the potential of reducing the path to attainment of a degree or credential. Student pay one to three years of tuition rather than four. I am not suggesting replacing any of the learning that takes place in a four-year degree, just the time it takes. According to one study (National Survey of Student Engagement), students spend an average of 17 hours a week studying. (In my opinion) the amount of weekly coursework should be at least 40 hours (a typical work week) and could easily reach 80 hours a week. (Something I remember experiencing while working towards an MBA, much of it was social and relationship building.) I also think traditional higher education institutions are going to join the progressive ones in adopting these CBL programs. Incoming students should take assessments and complete projects when they start a program. Find out where they are, then give them the right learning program. For example, if a student is versed in programming, there is no sense in spending three semesters taking the introductory courses. I propose a suite of applications, what I call a “Learning Scaffold for Skills”, as a platform for CBL programs. At the lowest level, there is Skills Label™ where learning expectations are defined for discrete tasks. On the display, users are directed to a resource or project and have all the information needed to complete the task. The learning is based on skills, competencies, and focus values. It is possible to incorporate learning standards into the labels too. Finally, a teacher or professor easily modifies a series of labels for each student to personalize the learning experience. I see a series of labels as an ideal way to represent what is required in a CBL program. Students go through each of the labels, comprised of projects and / or assessments and upon verifiable completion demonstrate a required competency. Students work on the projects at their own pace. To represent a collection of these labels at a course level, there is the app Skill Syllabi℠. A teacher or professor creates a syllabus which has all the sections of a standard syllabus plus sections for skills and competencies, skill labels, and tasks. At the program level (and a platform for lifelong learning) is Skills-Based Approach℠. Students import all the tasking in the labels and syllabi directly into their Skills Based Approach accounts. Then, they can move through the four stages of Skills Based Approach (an established methodology) to acquire the skills. This suite of apps become a platform for Competency Based Learning programs (both in education and higher education).